Welcome to our ultimate guide of garage door color ideas. They say that “details make a home”. There are a number of elements that help form the overall look of a home, and each part contributes to the curb appeal of house’s exterior. In the same way, any part of the home is as equally important as the other, and garage doors are no exceptions to that. 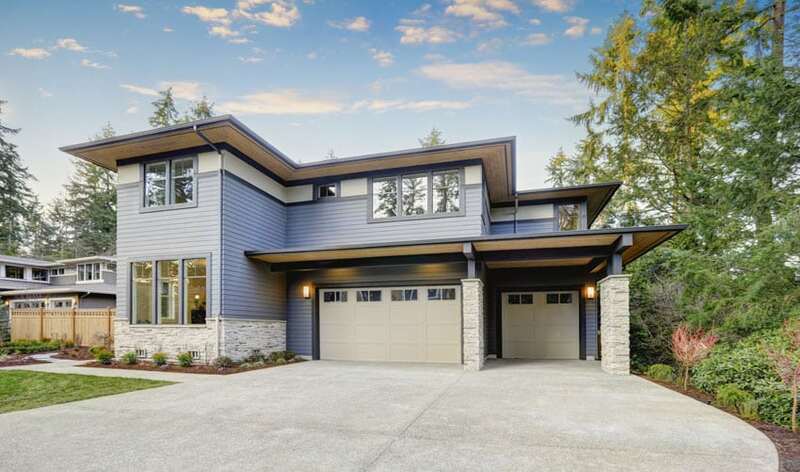 Below we’ll cover the meaning of garage door colors, and display garage door pictures of popular color choices to help find the right one for your home. Garage doors are considered to be one of the largest features of the home. Being the largest entry way to a house, it comprises nearly a third of a house. Though commonly neglected, it is a noticeable part which needs careful thought and attention in terms of design. It is a vital element of the home’s exterior appearance and creates an aesthetic impact which contributes to the overall appeal and value of the house. Picking the right color for your garage door is crucial as it affects your home’s character in different ways. It renders positive curb appeal, shows off your personality and can make your house stand out from the rest. With that, we need to be mindful of our decisions in picking the right color for a garage door. “The right color enhances the appeal of the home”. Color palettes affect the overall value of a home, whether positively or negatively. Aside from a variety of materials and finishes, there is a wide range of garage door color options which one can explore to customize the look of a home. Some garage door colors complement specific architectural styles, while others create contrast and add an interesting visual feature. The most common colors for a garage door are sand, ice white, clay stone, taupe, beige, brown, charcoal gray, soft gray, black and dark green and blue. The top five choices being the neutrals: white, cool gray, black, beige and walnut brown. Other custom colors like purple, red, orange, yellow are also available in the market. 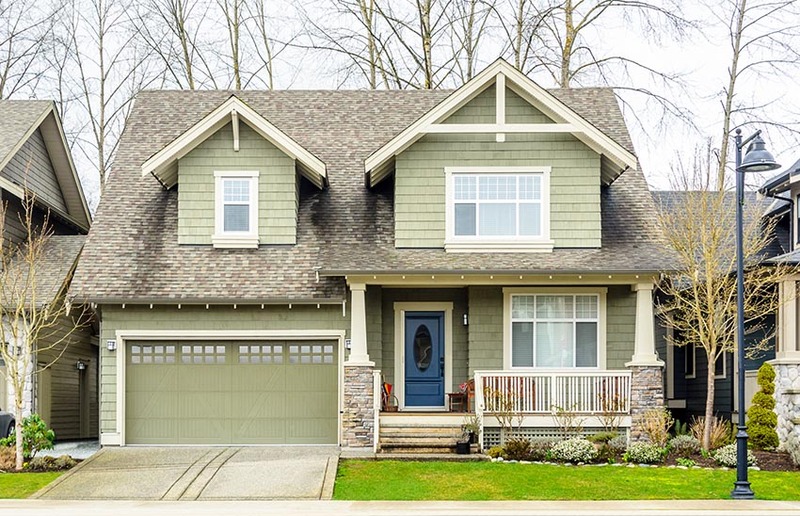 In this article, we’ll help you explore different garage door color ideas along with some advice on matching it with different kinds of exteriors. Read on as we help you decide what’s the best garage door color for your home. Choosing a color for your garage door doesn’t require technical skills nor extensive knowledge on architecture and design. However, since you garage door is as important as any part of your home, picking the right color for it needs careful thought and consideration. 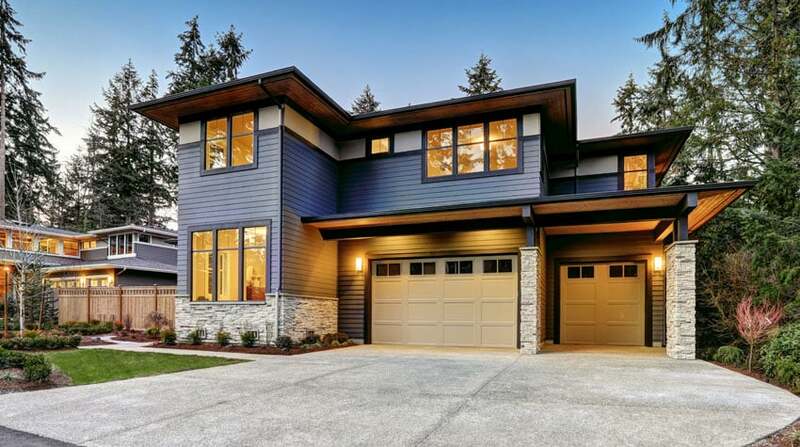 It is not as easy as sticking with a favorite color too, as garage doors are significant architectural features which comprise a third of your house’s facade. But how do you choose the right color to paint your garage door? There isn’t really a strict rule which one has to adhere to in terms of choosing the right color for a garage door. Design is also about self expression and provides room for displaying one’s taste and preference. However, there are still several guidelines which one can follow to avoid any design blunder and keep your house from looking like a visual chaos. There are different approaches that one can take in choosing the right garage door color for your home. These approaches use the following factors such as : (1) the style of your home, (2) the materials of your home, (3) other architectural elements in your home’s exterior, (4) your personal style and (5) color schemes based on the color wheel. Each approach allows you to come up with a garage door color that is perfectly fitting for your home. Using the style of your home. Your home’s architectural style and its colors is a good guide to see what works and what doesn’t when it comes to your garage door’s color. Each design style usually corresponds to a specific color palette. 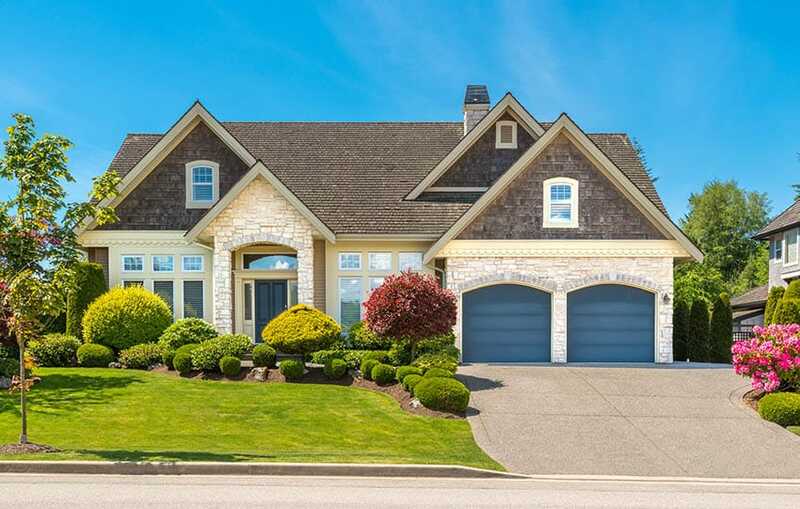 Traditional homes usually have garage doors which blend with the rest of the house’s color while a more current inspired house implements a more unique style using a more expansive color option. 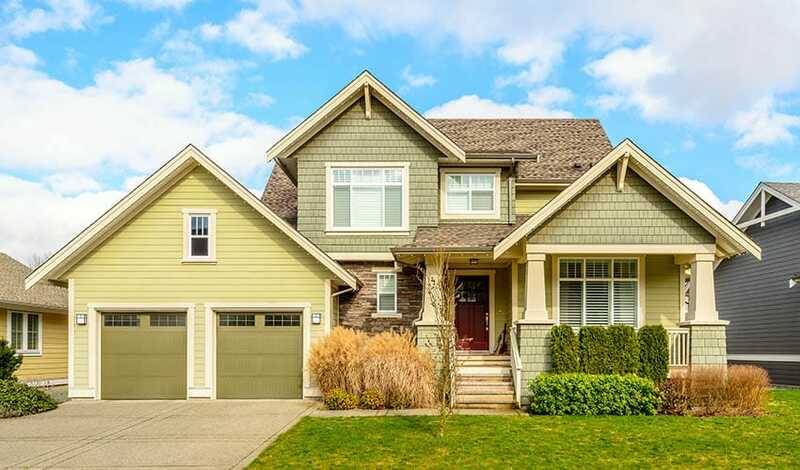 Traditional homes are also geared towards rich exterior color palettes and usually have wood grain finishes for their garage door. Contemporary homes go for anodized while minimalist houses go for clean neutrals like black, gray or white. While a more more adventurous palette include vivid pops of colors like red, blue or yellow. Using the materials of your home. Whether brick, stucco, wood or vinyl – in the same way that each of these materials match a specific color, it also may not work with other garage door colors. Brick, for example, has inherent warm undertones and work best with black and rich earth tone colors like sand and tan. Using other architectural elements in your home. Make sure that your garage door harmonizes well with trims, window sills, shutters and the front door. 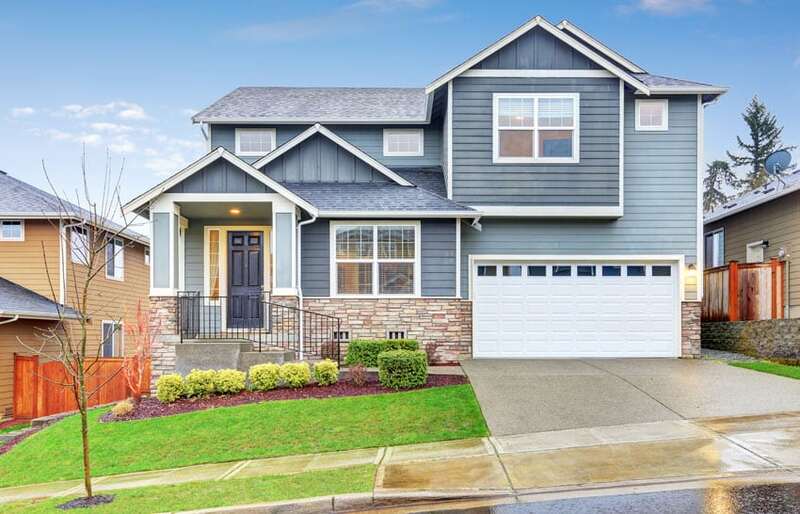 Although it is not recommended that the front door and garage door be of the same color, it doesn’t mean that they shouldn’t complement each other. However, there is an exemption to this rule as more traditional applications usually paint the garage door, front door and shutters in one color. Visit this page for more details about selecting front door colors for your home. Using the color wheel. Know a few color basics. It is highly beneficial to understand how the color wheel works when choosing the right garage door color for your home. The color wheel is a simple decorating tool which designer’s use to formulate a harmonious color palette which includes your garage door and other visual elements in your home’s architecture. Explore several color combinations such as a complementary color scheme, analogous color scheme, monochromatic color scheme and neutral color scheme. Using your personal style. Choosing a garage door color for your home offers endless design possibilities. Know what your preferences are. Do you want a sophisticated statement? Then an elegant black or dark green garage door might be the perfect fit for you. Do you want warmth and richness? Then explore red, brown and orange garage door colors. This actually very tricky as you have to do this while steering clear of an ostentatious color. Should you blend or contrast? Blending is choosing a color which doesn’t deviate from the color palette of the house while contrast is choosing an accent color to create depth and dimension within your home’s exterior design. If you do not want attention, match your garage door with the rest of your house to give it a harmonious look. If you want to make a statement, use a pop of color to add some visual interest to your home. Both options work well in choosing the right garage door color for your home as it gives it a different character. For example, a white house instantly brightens up when a different color is used for its garage door (contrast), while it looks more expansive and airy if a matching white garage door is used (blending). Should you paint your garage door the same color as your front door? The answer is “no”, but it really is up to you. Occasionally, matching colors for garage door and front door look good in several applications. Although there is no strict rule regarding this, it is popular belief that the focus of the home must be the front door. If your garage door and front door are the same color, the tendency is it draws attention away from the main entrance of the home. Reserve the accent color for the front door to make it the focal point of the house and try matching your garage door with other architectural features in your home’s exterior such as the shutters. You garage door must also never compete with your front door. 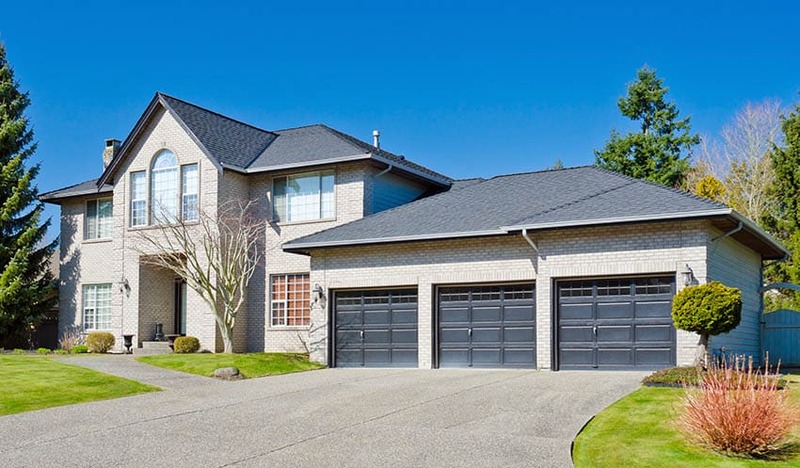 If your garage door that has a powerful color like red, blue, or yellow, it draws the attention away from the beauty of your house itself as it can become too overwhelming. Downplay your garage door color. Another common design mistake that homeowners must avoid is drawing too much attention to the garage door. In some cases, it becomes a design challenge especially if the garage door design or style is unattractive. The best solution that you can do here is to blend rather than contrast with the most dominant color of the house. Match the right parts of your house. What are some do’s and don’ts that you need to keep in mind to match your garage door with other parts of your house? First, your garage door color may be the same color as your house’s siding but is not recommended that it exactly matches the trims. The trims around your garage door may be the same color as your garage door or it may be matched with other trims. Stick to one shade of color. Some homeowners use a different color to highlight the details of a garage door. Using two colors for your garage door gives an outdated look. Also, avoid clashing colors : like a pink garage door, a yellow front door over a green house. Consider the overall look of your neighborhood. While standing out may be a good way to create a statement, it is not good to go overboard in terms of choosing a garage door color for your home. Try to observe the surrounding environment and use that as a guide for your garage door color options. Painting a garage door is one the easiest and cheapest quick fixes to upgrade the look of your home’s facade. Aside from choosing the right color for your garage door, another factor which must be taken into consideration is the process needed to change its color. 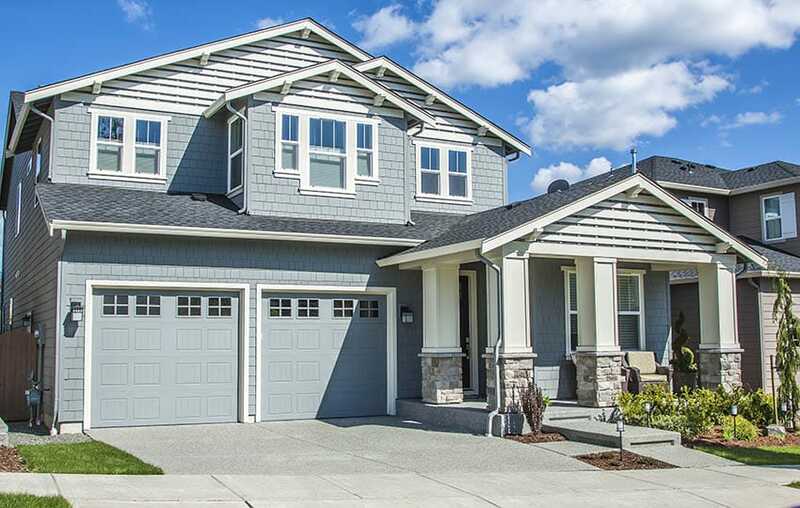 The garage door is considered to be one of the most dominant features of a home and any painting mishaps can cause an undesirable effect to the overall look of a facade. Choosing the right type of paint. The type of paint which you will be using depends on the type of material of your garage door. High quality latex paint is the most ideal paint type for all garage door materials but it especially works well for steel or aluminum garage doors. The reason why latex paint is used for most home improvement projects is because it is easier to work with and it dries more quickly. In addition to that, latex paint also comes in different finishes, varying from flat, satin and high gloss finish. You can also choose from other finishes like the wood grain finish which looks exactly like a wood panel. Acrylic latex paint is strongly recommended as there is no preparation needed other than cleaning and it adheres well to the garage door material. Oil based paint is a big NO for garage doors because they causes bubbles on the original or existing finish, eventually resulting into peeling off. For wood garage doors, make sure to use a primer before applying a coat of your desired paint color. Also, In buying paint for your garage door, choose the best quality you can afford as it pays it off in the long run. 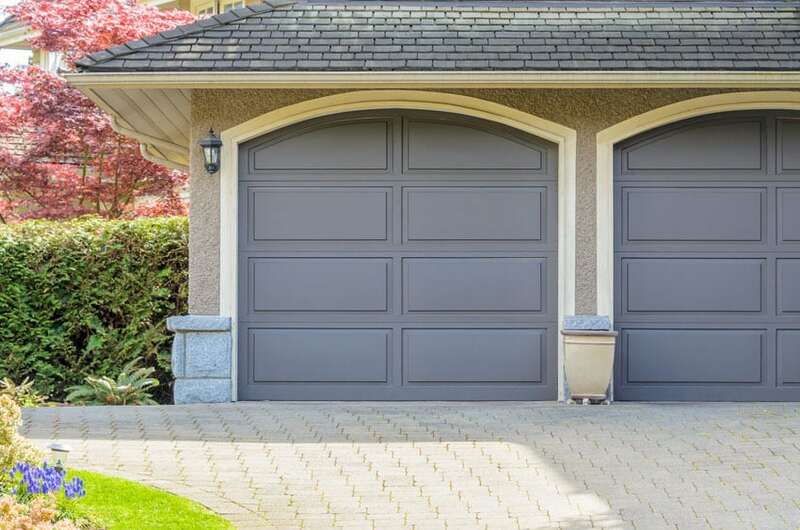 Garage doors are also constantly exposed to outdoor elements and have the tendency to fade, rust or chip, so make sure to take necessary actions to weather proof it. Determining the amount of paint you need. The amount of paint you will need is dependent on two factors, the size of your garage door and the kind of material of your garage door. How big your garage door is will help you determine the total coverage of paint based on an estimated area (in square foot or square meter). This can be computed using taken measurements and a simple formula. The type of material it is made of also plays a significant role because some materials take more paint to cover. The most common materials for a garage door are wood, steel, aluminum, composite and fiberglass. For example, a wooden door needs more paint to cover compared to an aluminum door. In addition to that, if you are going a shade lighter or darker, you may need more paint too, as opposed to repainting a garage door with the same existing color. Considering allowances for retouching and an ample amount to cover a whole garage door, it is safe to buy a whole gallon of your desired color. Consider the right timing. Timing matters! Deciding when to paint your garage door must be carefully thought of too. Wet, extreme cold and hot weather are not the right time to paint your garage door. Paint needs the right temperature to dry at an optimum level, otherwise it will look cracked or faded. The kind of material of your garage door also reacts to certain weather conditions. Aluminum garage doors, for example, expands and shifts during extremely hot weathers, thus needing more paint. Take the necessary preparations. Prior to painting your garage door, there are several steps that have to be done in order to prepare its surface. This will ensure a more long lasting color. Get your garage door ready by sanding off old paint using a sanding block. Wooden garage door need to be sanded down completely. Clean the surface of your garage door by using a pressure washer or a cloth with some soap and allow it to air dry. Pay attention to the bottom part because that is where dirt usually builds up. Check the hinges and hardware and apply a sealer, if needed, to protect them from rust. Cleaning is a crucial step because if the surface is not free from dust, dirt and grime, then there is a tendency for the paint to adhere poorly to the garage door’s surface. • Use a primer. A primer is needed if painting wooden garage doors or if changing an existing garage door color from dark to light. Use latex based primer if your paint is latex. Choose the appropriate type that is suited for your garage door’s surface. • Tape all edges. Use masking tape to cover edges and to prevent your paint strokes from going out of bounds. • Keep your garage door halfway open during repainting and start from bottom to up. For garage doors with a recessed panel design, begin at the corner of the recessed part. • Paint one panel at time. Use lengthwise directions and long slow strokes during application. • Do not hurry. Before applying your next coat of paint, make sure that your first single coat is completely dry first. • Use the right type of paint application. Aside from using a paint compressor, painting a garage door can be done with the use of a paint brush or a roller brush. A roller brush ensures a solid even color while a thick paint brush is ideal if you want to display the brush strokes. Blue garage doors bring a formal accent color into a house’s exterior without being too overwhelming or overpowering. It’s not as shocking as red, but it can also draw attention to your house. 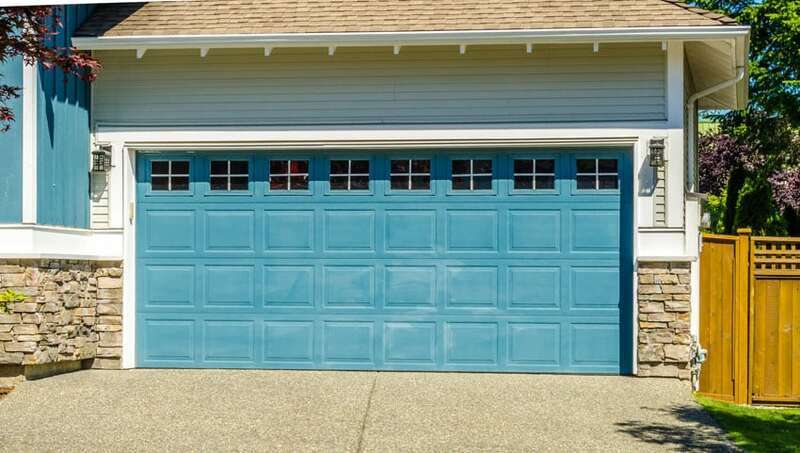 Teal garage doors bring a refreshing splash of color while navy blue garage doors work as an alternative for black. Blue garage doors work with a variety of architectural styles. Generally, bulge garage doors are an ideal match for earth toned houses, especially those with decorative stones of grayish blue undertones. 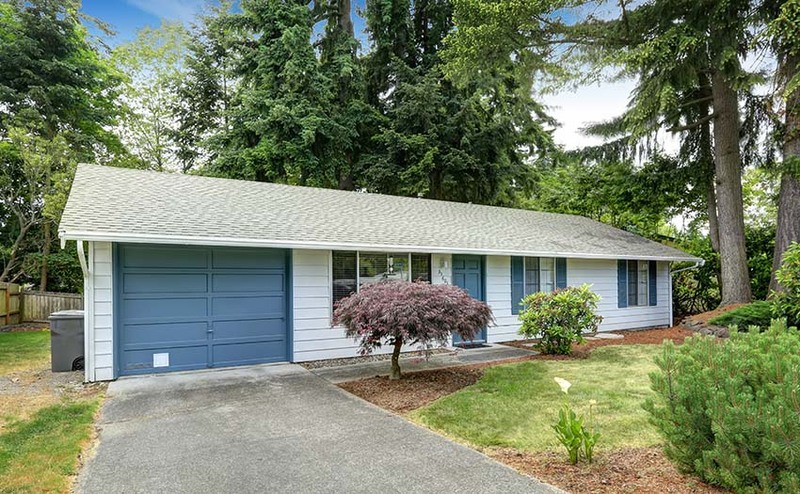 Other applications are : navy blue garage door works well with a red brick house exterior, while a dusty blue garage door blends harmoniously in a cool gray house. Blue garage doors look extra charming when combined with white trims. 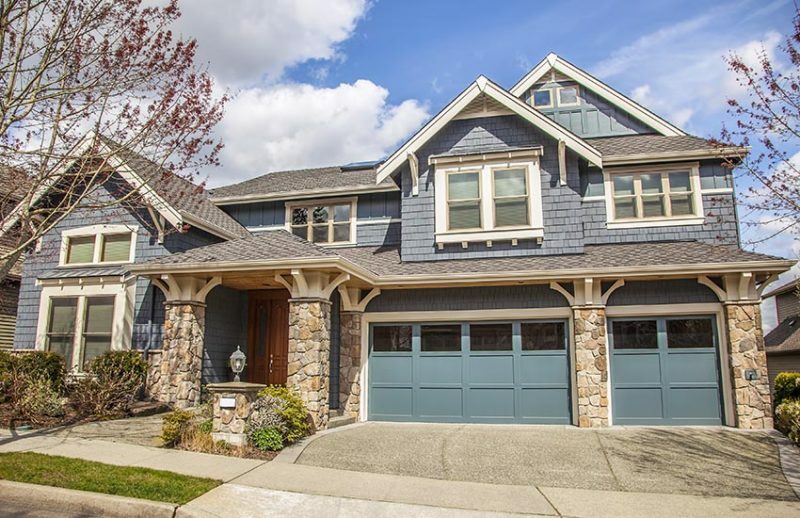 Dark blue garage doors provide an accent to the neutral palette of this traditional inspired home. 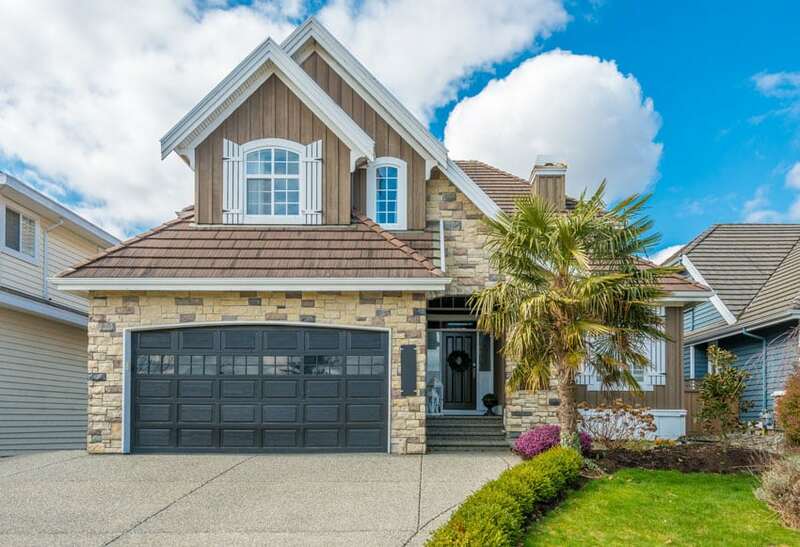 Combined with beige natural stones and brown shingle roofing, the matching colors of the front door and the garage doors complements the exterior of this home. This garage door’s color is an exact match to the dusty blue exterior of this American style home. The beauty of having a uniform color is that it gives a house’s facade a more expansive appearance. The cool hue of this teal garage door is a refreshing sight for a white house exterior. The color red brings intensity to a home’s character. It creates a strong impression and radiates a welcoming feel. 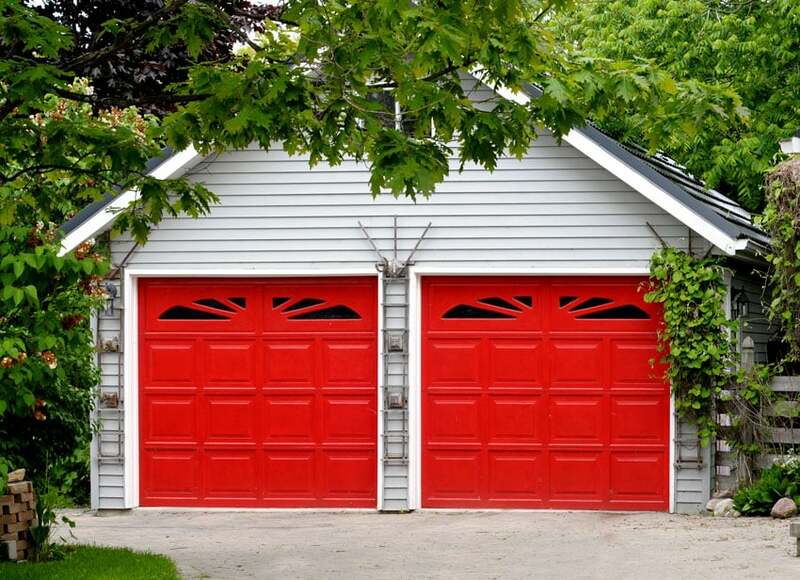 Red garage doors are intense visual components which direct the attention away from the house. This is the ideal color if you want to make your garage door stand out from the rest of the features of your home. 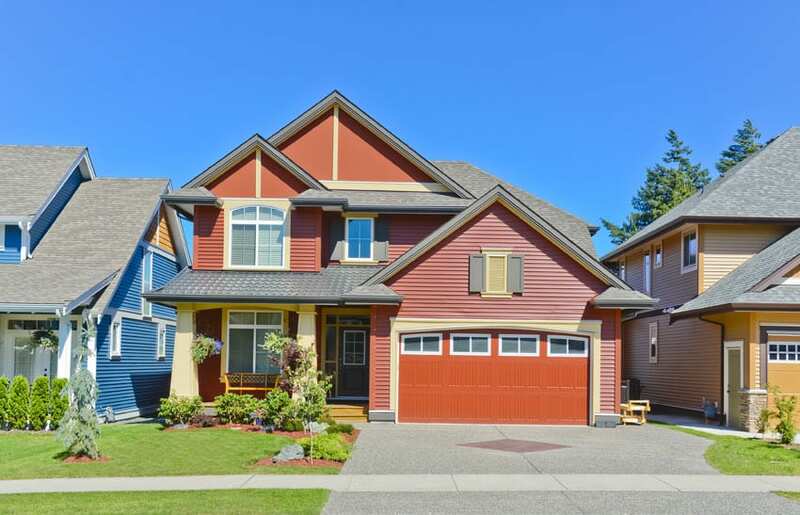 Aside from the popular ravishing red and fire red, there are less intense options like burgundy and maroon which work well as garage door colors for traditional houses. Red garage doors work well for neutral (white or beige) and earth toned exteriors. For more modern and adventurous applications, a red garage door can also be used for adding a punch of color for pale yellow or blue houses. 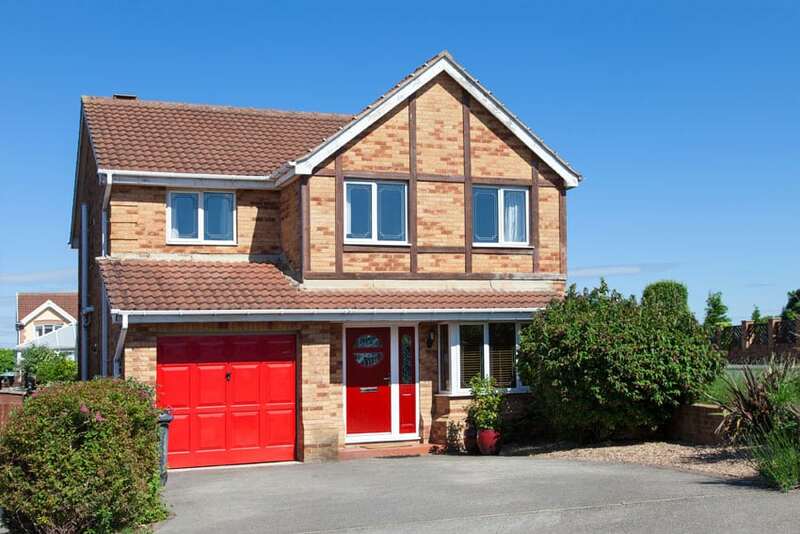 Red garage doors are a bold statement which can surely make any house stand out. The contrasting colors of white sidings and lush greens make its bright hue pop out more. This red garage door takes the limelight as it prevails of a canvass of tan colored bricks, brown terracotta roofing and white trims. The color scheme of this house’s exterior is warm and visually interesting. Gray is considered to be the “new neutral of the design scene”. It is the perfect color for homeowners who prefer neutrals but do not like the dullness of white and can not commit to the intensity of black. It is another timeless color which works with a variety of design styles. Gray garage doors are perfect for contemporary and modern homes which have neutral palettes. It also works well for houses with formal styles. If you also want to add a subtle accent to your home’s exterior, a gray garage door can render some quiet strength. It is also highly suited for balancing the look of a dark exterior. Another beauty of choosing the color gray for your garage doors is that you can either go darker or lighter, depending on your preference. A soft pale gray or cool gray hue is the perfect garage door color as it blends well with any color of exterior. The quiet strength of a gray colored garage door is perfect for monochromatic color schemes as it provides a formal accent color and does not deviate much from neutrality. This gray garage door blends harmoniously white this contemporary house’s exterior, black shingle roofing, natural decorative stones and white trims. The neutral color palette of this garage, composed of black shingle roofing, ash colored stucco and white trims, is perfect for a gray garage doors. Subtle and subdued, these gray double doors acts as the unifying color element for the formal look of this facade. The color green is perfect if you want your home’s exterior features to blend with the surrounding natural environment and lush landscapes. Green garage doors are perfect for creating balance while adding a muted contrast to neutral homes. This garage door color works best with brown houses and is a foolproof option for monochromatic exterior palettes. Green garage doors are also the complementary hues for red brick houses. The varying shades of green make this houses exterior ultra refreshing and natural looking. The olive colored garage door is a perfect contrast to the reddish brown front door but it is also a perfect complement to pear colored sidings and sage shingles. This fern green garage door adds a cool splash of color to the beige and brown palette of this country home. Green garage doors blend well with surrounding landscapes as they evoke a natural and organic feel. Just like gray and white, black is also considered to be another timeless color. A black garage door does not go out of style and delivers sophistication and elegance to a home. It is the perfect hue to explore if you want to create a formal contrast in light colored exteriors. Black garage doors are more popular in new home styles, with deep blue black as the new trendy shade which updates the look of a home. For traditional applications, jet black garage doors are more appropriate as it has a solid color. Black garage doors are also the perfect choice if you want to create a bold statement but want to veer away from vivid hues like red, yellow, blue and orange. It looks good especially on brick homes. One benefit of having a black garage door is that it hides dirt better than lighter colors like white or beige. However, its downside is that it can look abrupt if not done the right way. Set against natural stones of varying earth tones, this elegant back garage door renders sophistication to this contemporary home. Black garage doors also offer a timeless look which will surely last for years. This black garage door looks elegant and classy against the beige exterior of this two story American home. The strong yet reserved color of black is an ideal accent for formal houses as they do not have much intensity compared to bright hues. White is the most popular color for garage doors. Considered as a fail proof color in design, white garage doors work for any style of exterior whether it may be traditional, contemporary or modern. White garage doors also offer flexibility and versatility when it comes to matching with other colors for a house’s exterior. It works well with both light and dark exteriors and is ideal for creating both blending and contrast. It is also a classic timeless choice for garage door color as it is guaranteed to never go out of style even for a long period of time. The bright, crisp color of white garage doors also contribute a clean airy feel to houses. When placed against a dark exterior, it instantly lightens up the facade. While if placed in a light exterior, a white garage door makes the house appear bigger. However, one of its drawbacks is that it tends to show marks more easily compared to other darker colors, thus requiring more effort in terms of maintenance. White garage doors are also a classic favorite for traditional American or colonial homes, but a more streamlined design version also appears in modern minimalist houses. 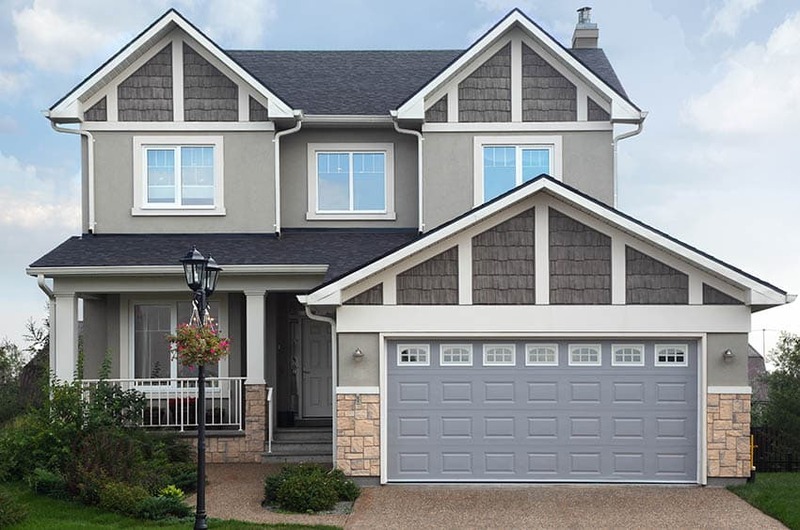 This two story traditional home has gray shingle, white trims, a black front door an a white triple garage door. The dominance of the color white coming from the garage radiate a clean and airy ambiance to this home. 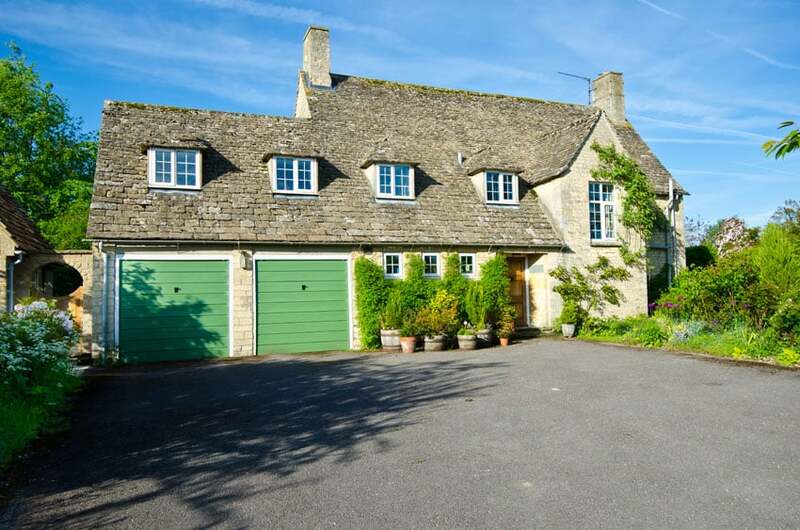 White garage doors do not only work for traditional inspired homes but for contemporary style homes as well. This two story house has a bluish gray exterior which is accentuated by sand colored decorative stones and crisp white garage doors. Brown garage doors, whether painted, stained or simulated as wood, bring a natural coziness to home exteriors. This hue brings warmth and a refined statement to exteriors. Brown garage doors come in a variety of light tones and dark shades.Natural stained wood garage doors have a natural beauty which shows stunning grains and rich colors. They also look expensive, especially walnut brown garage doors. Some garage door materials simulate the appearance of wood too and they also have their own character. The trick to using brown garage doors is to choose the right shade of brown to go with your home’s exterior palette. Brown garage doors work well for traditional and contemporary exteriors. This is also your best choice if you want to apply a monochromatic scheme for your home as brown works well when combined with earth tones and sand colors. The palette of this country home is a balance of warm and neutral tones, composed of a yellow exterior, white trims, cool gray roofing and brown front and garage doors. This brown garage door also offers a muted accent color for the facade. This home showcases a dark brown garage door on a modern gray house with a cobblestone driveway. This stylish home features a three car garage with polished brown teak wood with matching wood used for the home’s architectural details like its wood fence and support pillars. A modern driveway is constructed from interlocking pavers and winds up to the home’s entry door. Beige garage doors are a perfect match for warm colored exteriors. 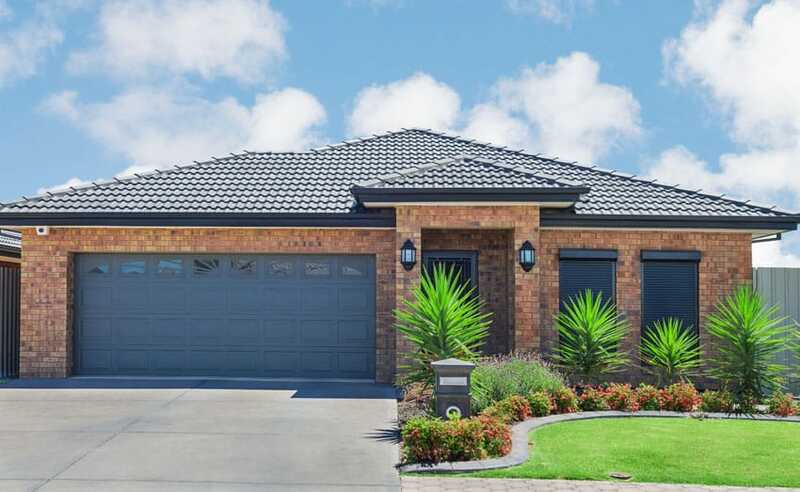 When used for a house with beige brick exteriors, a beige garage door camouflages the garage well by blending harmoniously with the overall palette of the house. The warm sunny color of this house’s exterior is the perfect background for neutral colored architectural elements like the beige garage door, gray stone posts and gray shingle roofing. The subdued color of the garage door also tones down the brightness of canary yellow, making the updated look of this facade more formal. A yellow garage door brings a cheery and bright feature for your home. Another ideal option if you want your garage door to be the focal point. This also brings an illuminating highlight to your home’s facade and can make your house stand out. This garage door color works well with blue house exteriors. Soft pale tones can bring a subdued contrast while vivid shades like canary yellow work for daring color schemes. 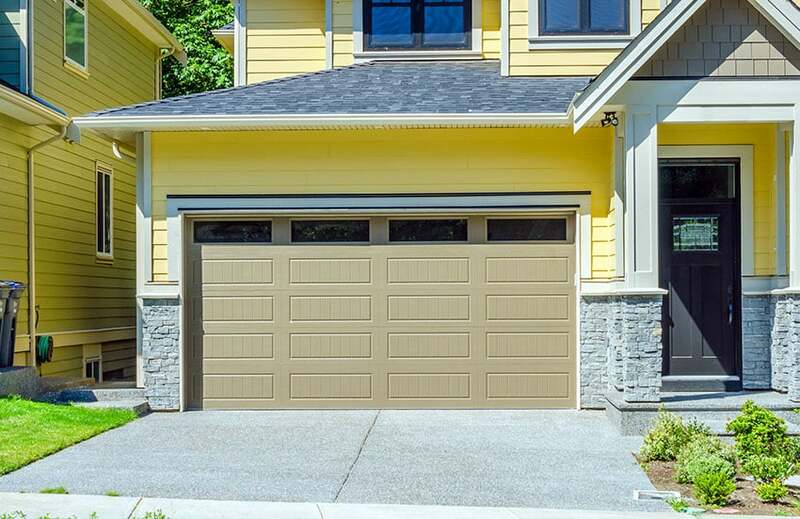 The trick to using a yellow garage door is to temper it with neutrals to reduce its intensity. 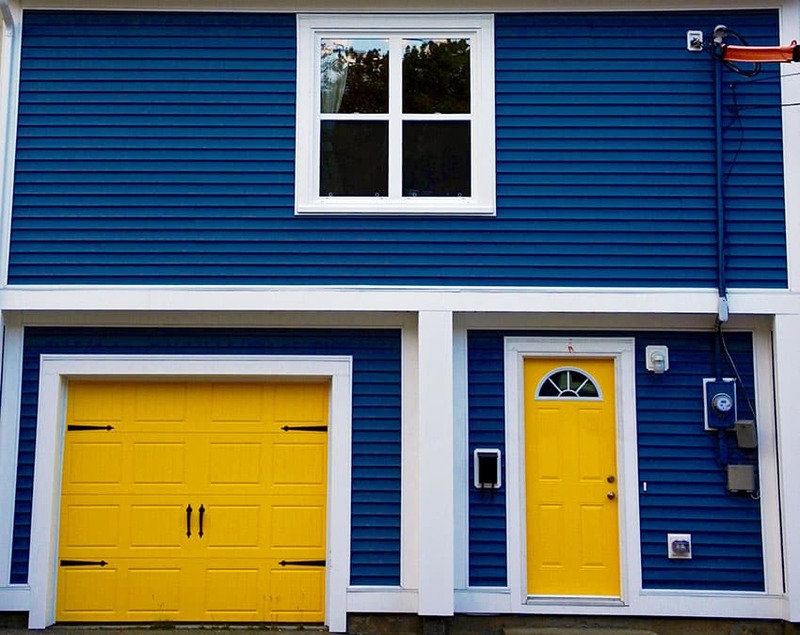 This vibrant blue facade has a bright sunny yellow garage door and front door which serves as an interesting focal point for this home. Guests will surely feel cheery just by looking at this warm illuminating color. The color orange adds warmth to home exteriors. This striking garage door color is also another eye catching hue and is appropriate if you want your garage door to be one of the main features of your home. However, this color can also blend in with terra cotta bricks. Orange garage doors are impeccable when combined with wood and earth tone exteriors. Orange garage door color ideas are gaining in popularity as the color has been frequently used lately for front doors. This orange garage door renders a warm inviting feel to the complementing terra cotta colored exterior of this two story home. Situated in a colorful neighborhood, this house beams with its own distinctive character which is reflected by the monochromatic rust orange color scheme. 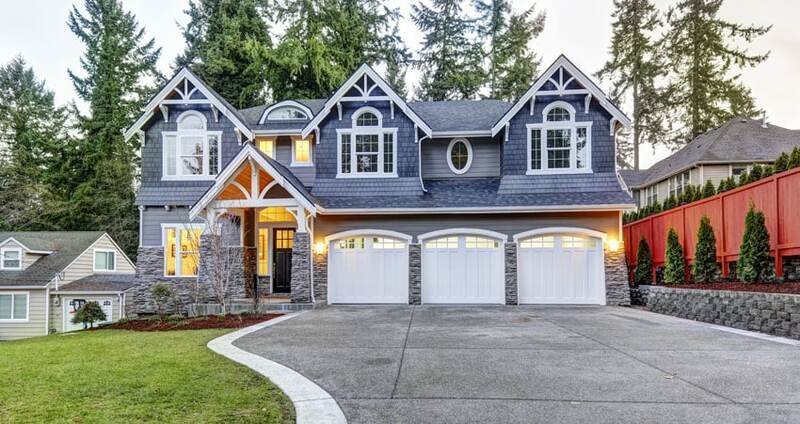 The rich dark color of a purple garage door gives a house some regal flair. If you want a dramatic accent color for your house, then this might be the right choice for you. 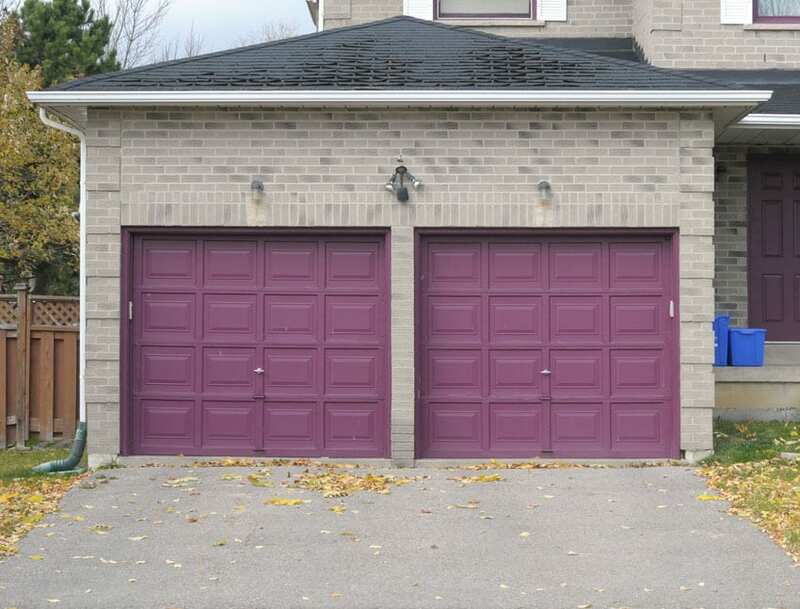 Purple garage doors match gray exteriors and is also a well loved garage door color for red brick houses. This color also works for both traditional and contemporary styles. This lovely traditional home looks like it just came out of a story book. The purple garage door adds a charming touch and classic flair to neutral exteriors and white trims. The soft delightful color palette of this house also stands out against the surrounding colorful blooming garden. This dark, rich eggplant colored garage door brings a dramatic visual component to this garage’s gray brick exterior. It brings just the perfect amount of intensity to soften the look of the formality of this facade. Sandstone colors are comprised of soft and muted earth tones – colors which are usually reminiscent of the earth and soil. This color is like the middle shade in between brown, gray – kind of like taupe. Sandstone colors are considered as timeless neutrals which bring coziness and warmth to house exteriors. A sandstone color garage door is another alternative to beige and brown. This is a flexible garage door color because it can be used for traditional and contemporary exteriors, particularly those with a dark earth tone color palette. Sandstone colored garage doors match the beige architectural components of this bluish gray modern home. The mellow palette of this exterior is delight to look at as it has a calm and refreshing appeal to it. The same house featured above but only with warm ambient lighting – this home looks extra cozy as night time approaches because warm tones radiate through the neutral facade. In this picture, we also see how the sandstone colored garage doors look differently in response to natural and artificial lighting. Although bricks are usually used for traditional home exteriors, choosing the right color palette for this type of exterior is not limited to conventional colors. Bricks are versatile materials in terms of color matching. While no red brick is purely red and no brown brick is purely brown, the variety of shades of warm colors and undertones allow homeowners to create either harmony or contrast in design. Whatever your preference may be, both approaches give your house a distinct style and character. Choosing the right garage door color for a brick house really depends on whether you want to blend or contrast. A harmonious effect is created by selecting one color from the shade of the bricks then using that for your garage door. Contrast, on the other hand, is achieved by separating the color of your garage door from the bricks. Red bricks usually have warm rich undertones like red, terracotta, rust orange, yellow, tan, brown, or subdued neutrals like cream, shades of gray and sometimes occasional accents of specks of blue. Brown bricks have a neutral earthy tone with varying shades of sand colors. These fundamental colors can serve as a guide for picking the right color of garage door for your home. The key to creating a harmonious color scheme between the garage door and a brick house is to choose color which blends with the color of the exterior material. Choose an undertone and stick with it. The colors may be adjusted by going a shade lighter or darker. A subtle color scheme may be achieved by using a paler shade of one of the brick’s undertone while a bolder color scheme may be achieved by using a darker tone. Using this approach will blend your garage door with the rest of your house. However, if you want to direct the focus of to your garage door, then contrast is your best bet. Choosing a color which acts as an accent can bring depth and dimension to your house’s overall look. Contrast may also be achieved by using a complementary scheme that is based on the color wheel – for example, red bricks may be matched with a muted green garage door. The architectural style of the brick home may also be taken into consideration when picking a garage door color. A more traditional color scheme goes for restrained neutrals like gray, white and black. A contemporary palette opts more lively options like teal, purple or navy blue. Also, do not go with a garage door color that clashes with the color of the bricks or the front door. 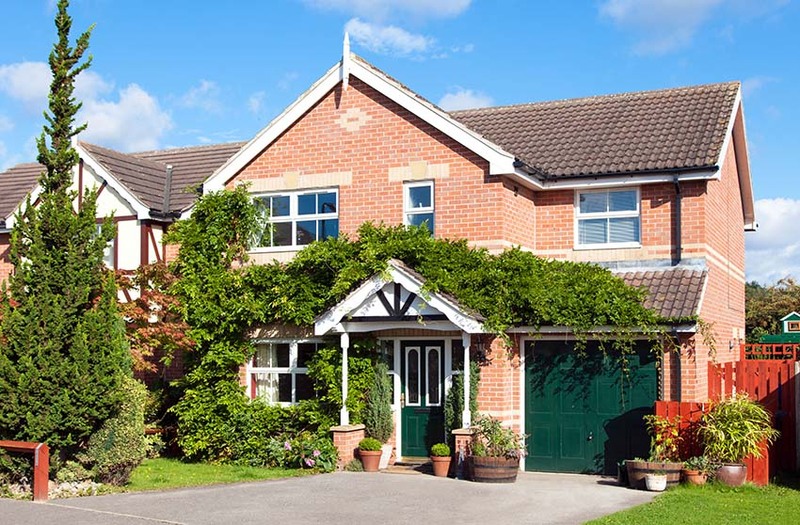 For example, a red brick house does not go well with a shocking yellow garage door. What are the best garage door colors for a brick house? For red bricks, brown, mahogany and walnut are a classic favorite. Black garage doors are elegant and give a formal contrast. Other neutrals like gray, white and beige are also good secondary options. For a more contemporary appeal, go for contrasting hues like a muted shade of green, navy blue and rich purple. Do not go for intense colors as they are too overwhelming and may end up as a visual chaos when placed against the interlocking patterns of bricks. For brown bricks, use earth colored garage doors like sandstone, brown, taupe and wood finishes. Brown house exteriors are the perfect opportunity to apply a monochromatic color palette. Classic neutrals like black, beige and cool gray are also ideal options. This elegant black garage door adds a stunning contrasting design element to warm brown bricks. The matching colors of the tile roofing, windows, front doors and garage doors unify the look of this home. Choosing a garage door color that is the same color as the house’s exterior is considered as one of the most traditional approaches in home design. In addition to that, most designers and homeowners also consider this as a “fail proof formula” in exterior color palettes. 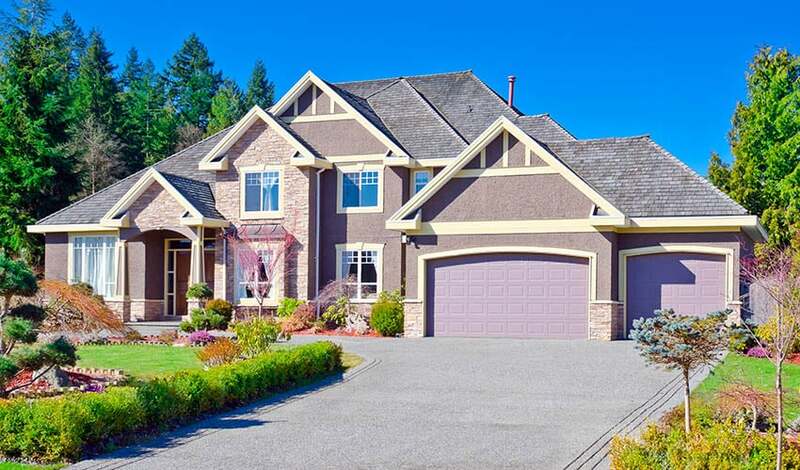 A garage door which exactly matches the exterior color of a house does not attract much attention to the garage door. 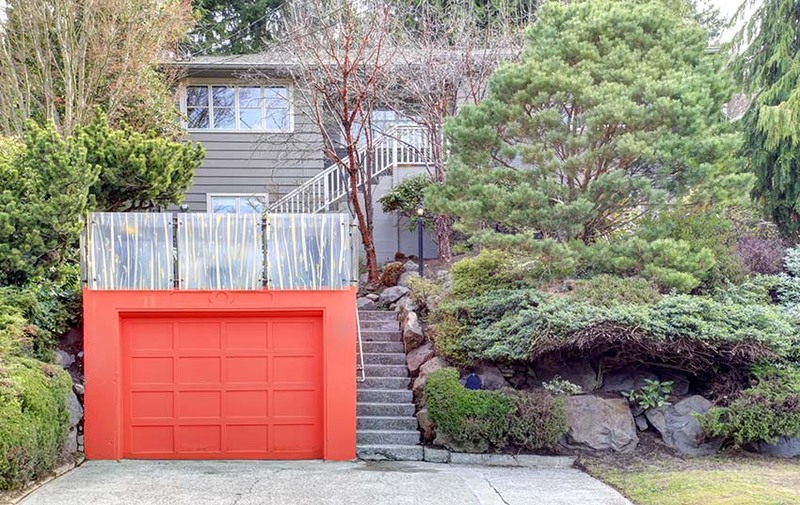 One key design guideline in choosing garage door colors is to draw the least possible attention. This is ideal if you want other architectural features to be the focus of your home. This also allows you to let your front door stand out while the rest of the house’s dominant features blend together. Aside from that, one benefit of this design approach is that it makes a house appear bigger, as less colors are used and continuity in the scheme is ensued. 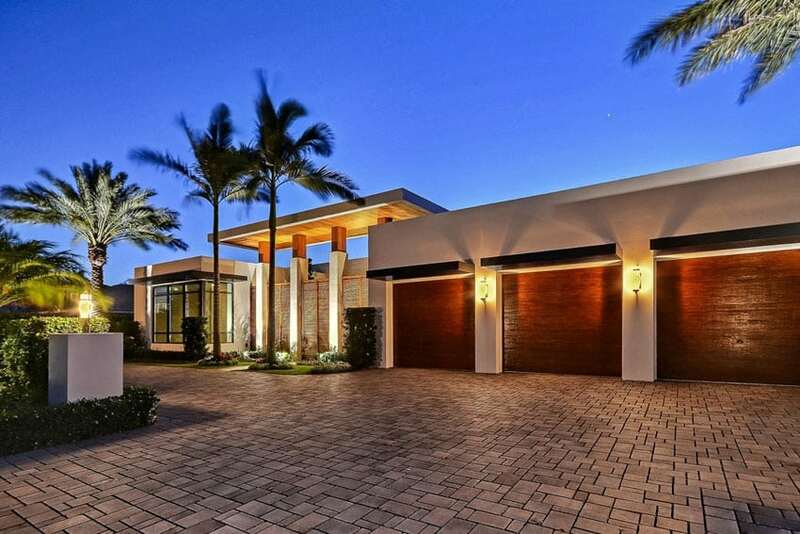 For example, neutral homes look brighter and bigger when matched with beige or white garage doors. Painting a garage door the same colors as your home’s siding is also considered a classic understated look which can last for years — though traditional, it isn’t outdated. It is also an ideal solution for houses with unattractive garage door designs and styles as it acts as a way to conceal such flaw. If your garage door matches your home, then the eyes aren’t directed to it. 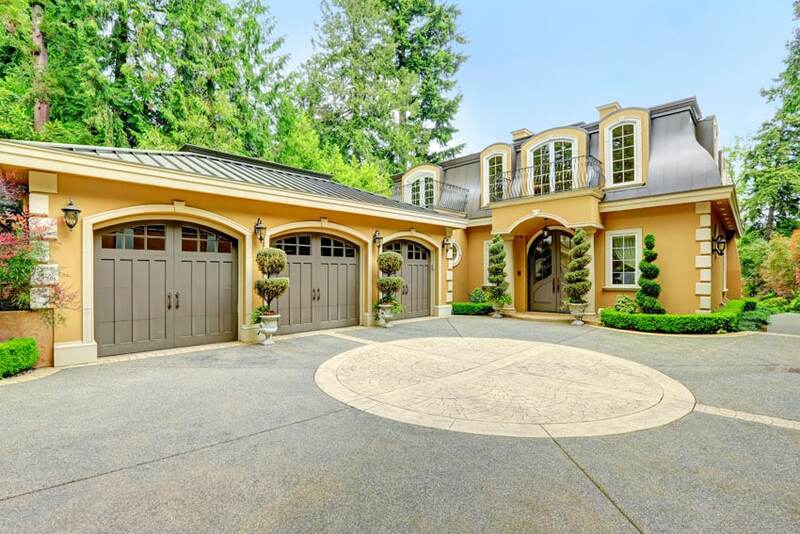 This garage door matches the beige sidings of this traditional home. The addition of blue front door creates an energizing visual component. Garage doors which are the same color as the house make facades appear bigger. We hope this gallery of garage door color ideas was helpful and gave you plenty of inspiration for painting your own home’s exterior. For additional color inspiration check out our page about paint color visualizers to help you find the shade that’s right for your home’s style.